In the past, teeth were restored using mercury containing fillings which have been know to expand and cause tooth fractures. Now, with modern restorative materials, it is possible to restore teeth to its original color and shape. Teeth can now be restored using materials that not only look like the natural enamel, but have similar properties to natural teeth, thus eliminating the use of mercury-containing materials that may be hazardous to your health. These bonded restorations virtually restore the tooth to its original form, strength and color by incorporating all the natural characteristics and anatomy the tooth had before decay. They are practically invisible. 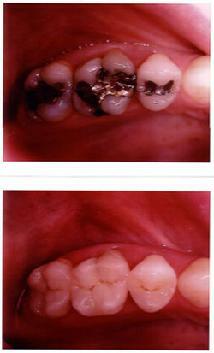 They often contain Fluoride that may help in the prevention of recurrent decay.